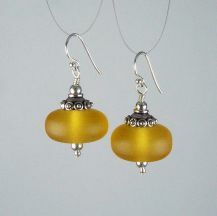 I love the color and feel of these butterscotch-colored resin beads. They are light weight and look like butterscotch candy! Sterling silver beads, beadcaps, and earwires; wire wrapped. About 1-5/8"